Corrugated boxes are a staple of the packaging world, and your number one choice for safely delivering products to your customers. Available in multiple sizes, shapes and wall thicknesses, they can accommodate almost any kind of object. Corrugated boxes also come in box styles that offer unexpected uses and functionalities, like shipping artwork or reducing the need for packing tape. They’re strong, sturdy and reliable, handling jobs other shipping containers can’t. When a mailer won’t do, a box certainly will. All corrugated boxes ship and store flat to save space. Interested in more than just kraft and white colours? Thinking about creating custom branded packaging for your business? Be sure to try out our custom shop, where you can create custom boxes in multiple sizes, styles and colour options. C-3067 Stock Sizes 3 x 3 x 3"
C-3068 Stock Sizes 4 x 4 x 3"
C-3069 Cube 4 x 4 x 4"
C-3070 Stock Sizes 4 x 4 x 4"
FOL4X4X4 Cube 4 x 4 x 4"
C-3071 Stock Sizes 4 x 4 x 5"
C-3072 Stock Sizes 4 x 4 x 6"
C-3076 Tall 4 x 4 x 8"
C-3073 Tall 4 x 4 x 9"
C-3075 Tall 4 x 4 x 10"
C-3074 Tall 4 x 4 x 12"
C-3077 Tall 4 x 4 x 16"
C-3078 Tall 4 x 4 x 18"
C-3079 Tall 4 x 4 x 20"
C-3080 Tall 4 x 4 x 24"
C-3083 Tall 4 x 4 x 28"
C-3081 Tall 4 x 4 x 30"
C-3082 Tall 4 x 4 x 32"
C-3085 Tall 4 x 4 x 36"
C-3084 Tall 4 x 4 x 38"
C-3086 Tall 4 x 4 x 40"
C-3087 Tall 4 x 4 x 48"
C-3089 Tall 4 x 4 x 60"
C-3091 Tall 4 x 4 x 74"
C-3098 Stock Sizes 5 x 5 x 3"
C-3093 Stock Sizes 5 x 5 x 4"
C-3092 Cube 5 x 5 x 5"
C-3097 Stock Sizes 5 x 5 x 5"
C-3095 Stock Sizes 5 x 5 x 8"
C-3094 Tall 5 x 5 x 10"
C-3099 Tall 5 x 5 x 12"
C-3096 Tall 5 x 5 x 36"
C-3102 Tall 5 x 5 x 48"
C-3101 Tall 5 x 5 x 50"
C-3100 Tall 5 x 5 x 60"
C-9931 Stock Sizes 6 x 4 x 2"
C-3109 Stock Sizes 6 x 4 x 4"
C-3108 Stock Sizes 6 x 4 x 8"
C-3106 Stock Sizes 6 x 5 x 4"
C-3107 Stock Sizes 6 x 5 x 5"
C-3110 Flat 6 x 6 x 2"
C-3111 Stock Sizes 6 x 6 x 3"
C-3112 Stock Sizes 6 x 6 x 4"
Boxes are often called the industry standard. Which makes sense, considering they’re the most used shipping container in existence. Some people even call them a staple of the packaging world. Which is a pun, sure, but it’s a fun one (hey, way back when, puns were considered the highest form of literature!). Shipping boxes come in all shapes and sizes, with varying wall strengths and purposes. Whether it’s helping a friend (or a client) move, packing up products to ship them across the country, or even just using one as a temporary recycling bin. They’re strong, sturdy and reliable, taking on the packing and shipping jobs other containers can’t. Though they take up space once built, brand new boxes ship flat and in a stack. This way they’re easy to deliver, taking up less room in an already crowded truck. They’re also easy to store, taking up less space in a packed office supply room. And they’re easy to grab just one when you need it. You’re not limited to the standard brown cube, either. With styles meant for file storage, packing away specific kinds of furniture, or being used for e-commerce customer orders, corrugated boxes are a highly versatile and compelling form of shipping container. Some styles don’t need packing tape to construct them, either! Don’t forget to measure your products before choosing shipping boxes for them. Also, be aware that the listed size for a box is its inside dimensions. If you’re not careful with your choice, you can be hit with hefty dimensional weight shipping charges. If you’re looking for more custom packaging, be sure to visit our custom shop. It’s a great place to start building the custom branded packaging that’ll make your customers stand up and take notice. So, stick around here. 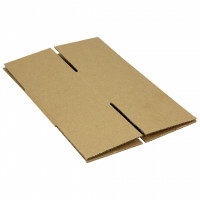 You’ll find all the corrugated boxes you’ll need right here at The Packaging Company.